The Corny Collins Show, featuring your man of the hour, Corny Collins (Schuyler Robinson), as well as the super-plucky, oh-so-hip, let’s-not-make-waves “Council” members. 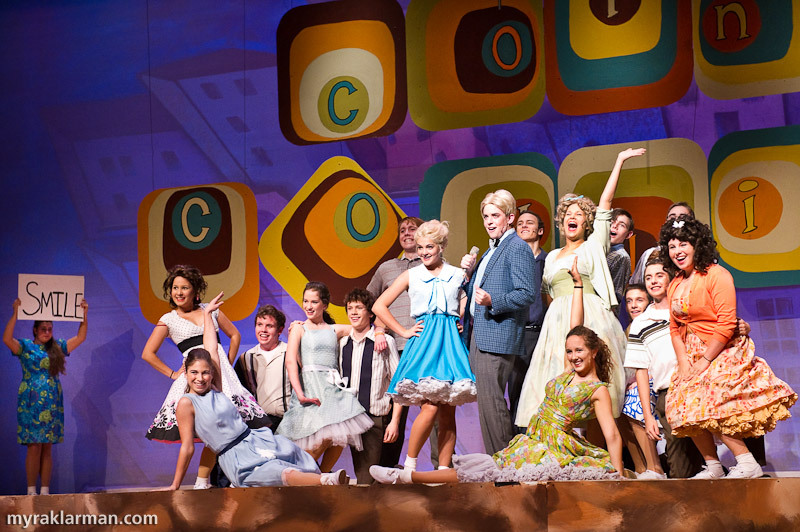 Corny’s wig was died brown for opening night. Please tell me you went to this show. Wasn’t it amazing?! I wanted everyone to see it — in person. 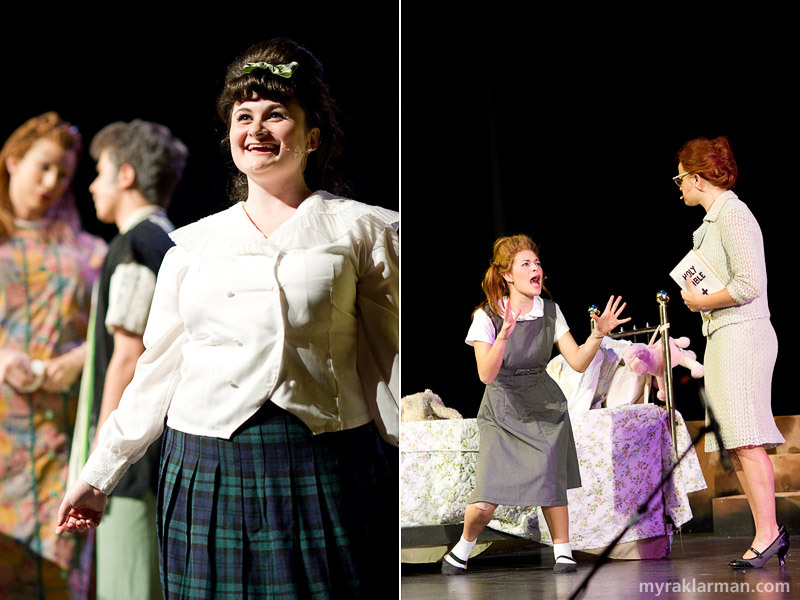 If you missed it, I’m sorry to say that these photographs, taken at the final dress rehearsal the night before opening, cannot begin to replicate the experience of actually being there. 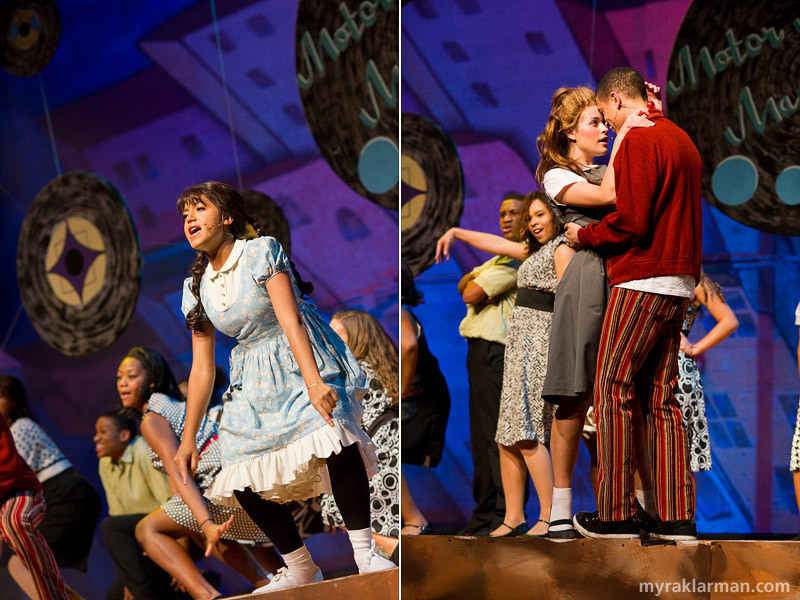 As vibrant as they may seem, they pale in comparison to the action and energy of the actual production. 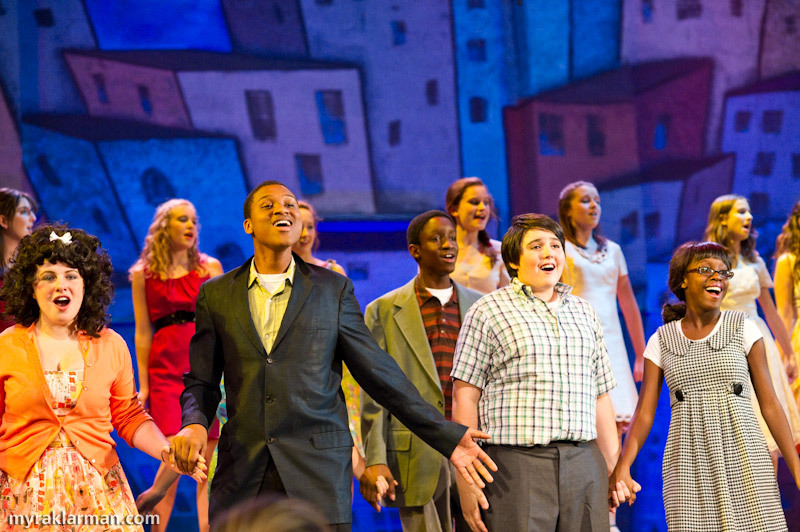 Congratulations to the cast, crew, and staff who all pulled together to make this very ambitious production shine. Everything was spot-on: the costumes, sets, props, hair and makeup, lighting, sound, orchestra, direction and choreography, the poster, the singing and acting (the actors so convincingly “embodied” their characters), as well as all the other important elements that I’m forgetting to list. 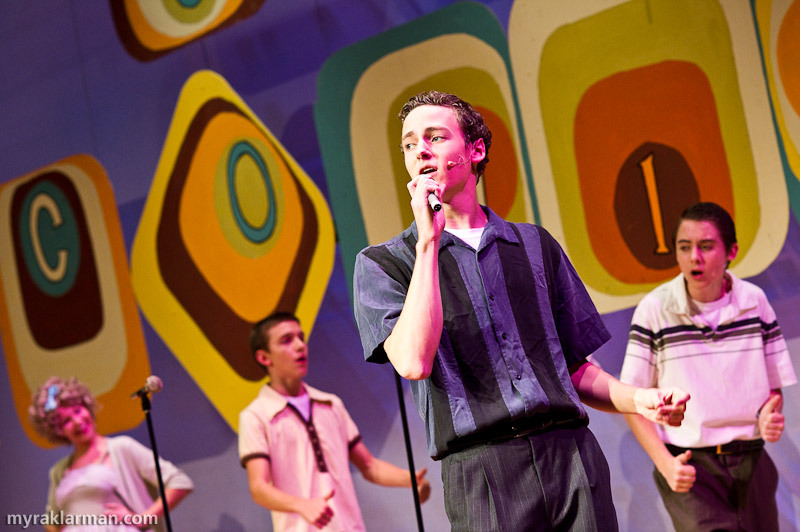 It came together so seamlessly and with such spirit that the joyful music lives in your heart for days, weeks, and (based on my experiences with past Pioneer Theatre Guild triumphs) months and years. 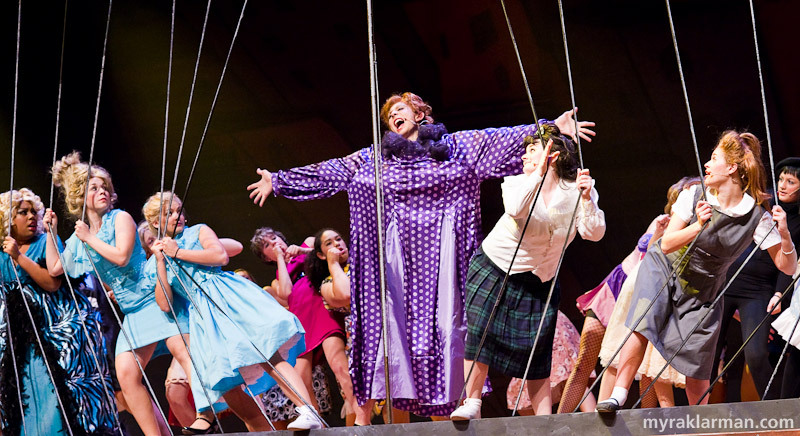 Thanks, Pioneer Theatre Guild, for taking us on the wonderful, toe-tapping, uplifting ride that is Hairspray. Not that I would want to, but it’s crystal clear: You Can’t Stop the Beat! 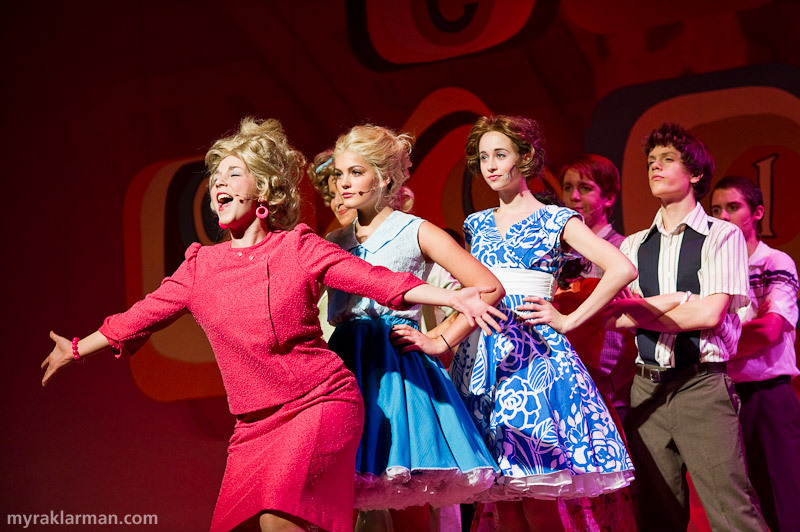 Velma Von Tussle (Victoria Reackhof) somewhat skankily reminisces of her past glories as “Miss Baltimore Crabs.” Amber Von Tussle (Carlina Paull-Baird) expects to follow in her mother’s footsteps, and be crowned Miss Hairspray. Penny and Tracy’s parents are sitting in the Turnblad living room and tuning in to The Corny Collins Show. 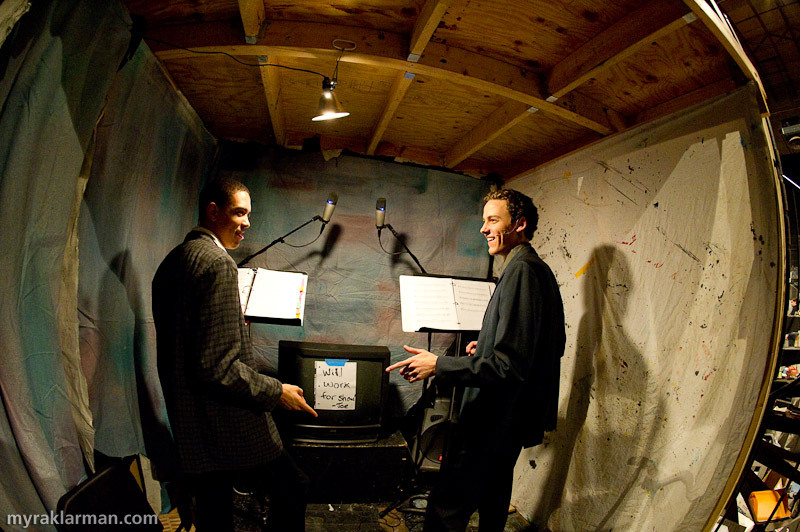 The entire rear of the stage was elevated and fronted by a rectangular frame (complete with curved corners and tuning dials) to create the feel of a vintage TV set. 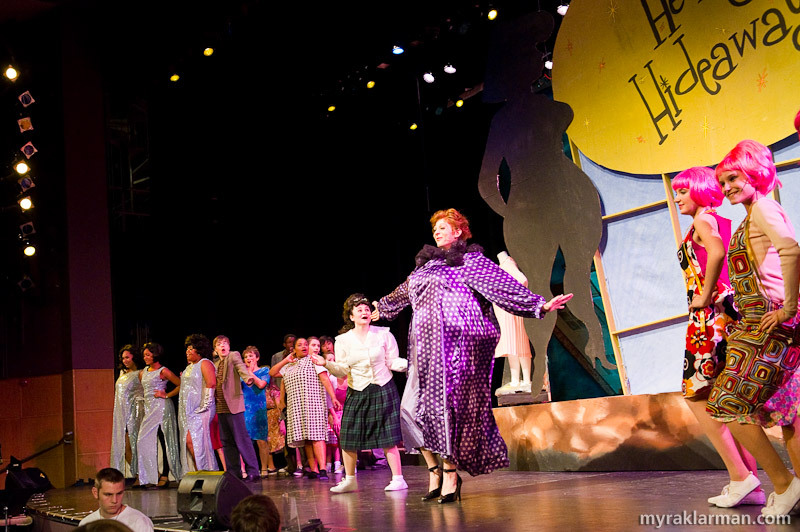 Russell Norris in a fat suit and a house dress! 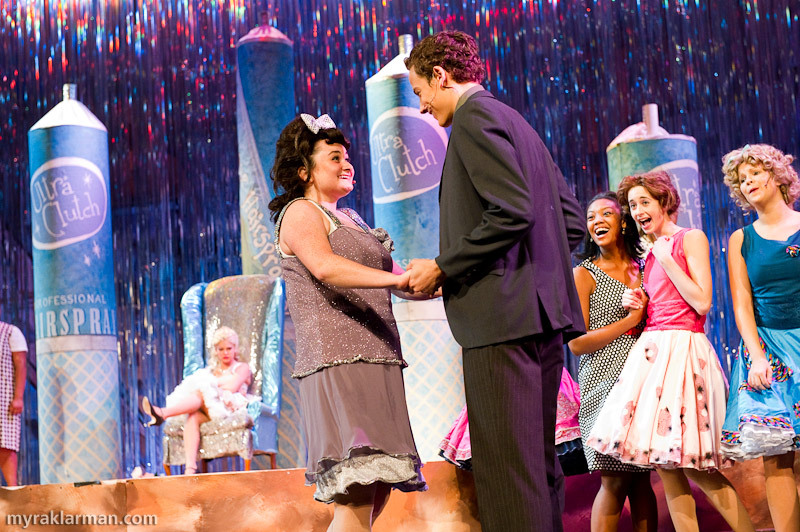 In a tradition going back to the very beginning of the John Waters movie Hairspray, Tracy’s mother, Edna Turnblad, has been played by a male actor in drag. Russell was awesome! | Speaking of awesome, the prop crew did a fantastic job of evoking the kitschy, unhip, early-60s-Baltimore Turnblad homestead — flowers and poodles and doilies, oh my! 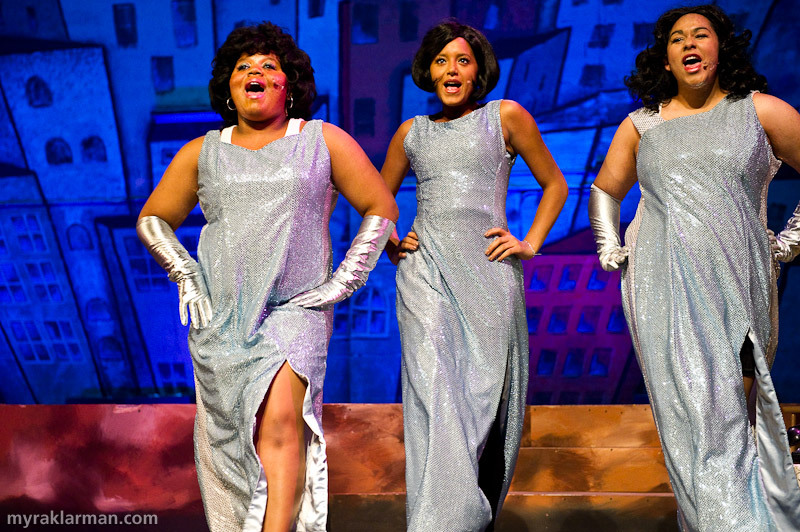 The lovely Dynamites (Aina Kelsaw-Fletcher, Mai Jammeh, and Taryn Thomas) provide the soundtrack, “Welcome to the 60s,” as Edna (after being a shut-in for several years) finally ventures out into the world. 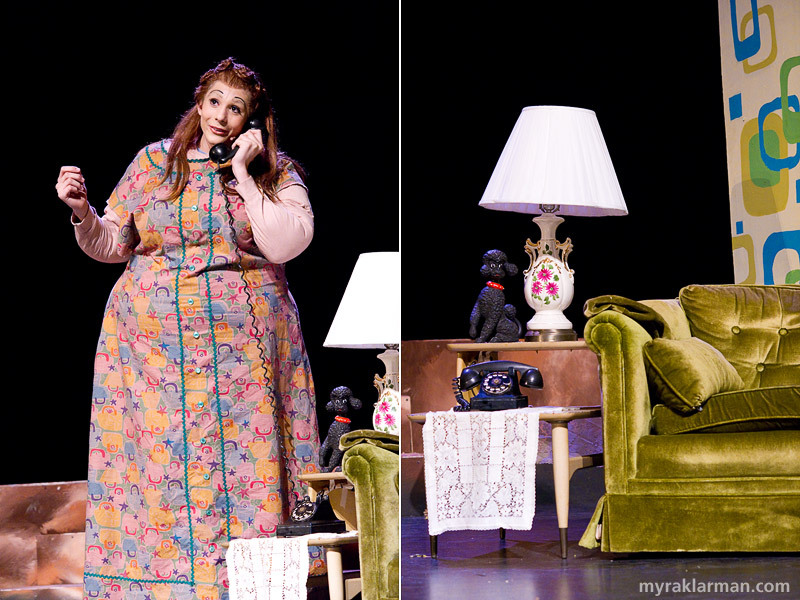 Edna (Russell Norris) shows off her new look courtesy of Mr. Pinky and his Hefty Hideaway. Check out those 5″ heels! 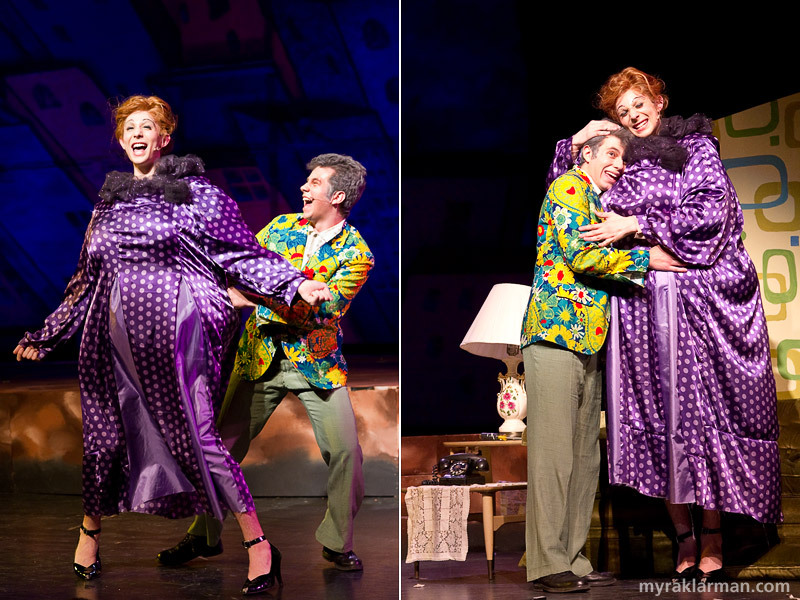 They not only helped Edna physically tower over all the other characters on stage — note that Russell is 6′3″ in bare feet — but also kept me on the edge of my seat as though I were watching some death-defying stunt. Needless to say, Russell adeptly kicked them up with unbelievable skill and finesse. Little Inez (Mai Jammeh, an exchange student from Germany) shakes a leg at Maybelle’s Record Shop. 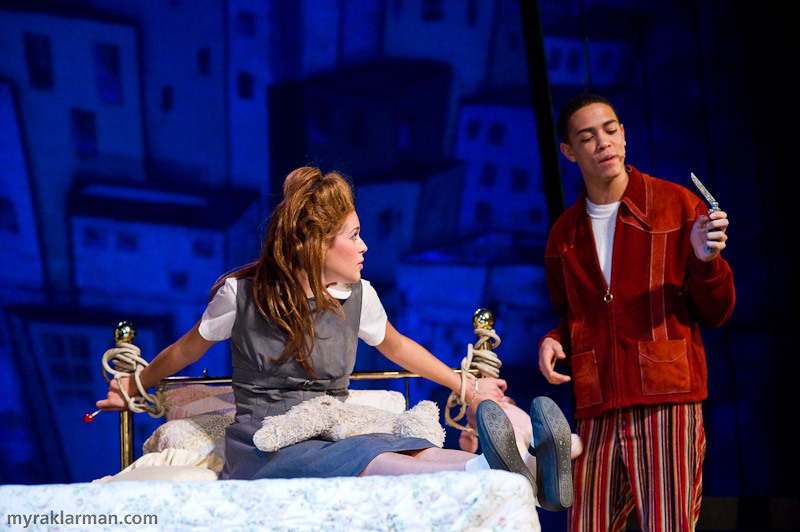 | Penny Pingleton (Mara Abramson) falls in love with Seaweed J. Stubbs (Tre Brown). 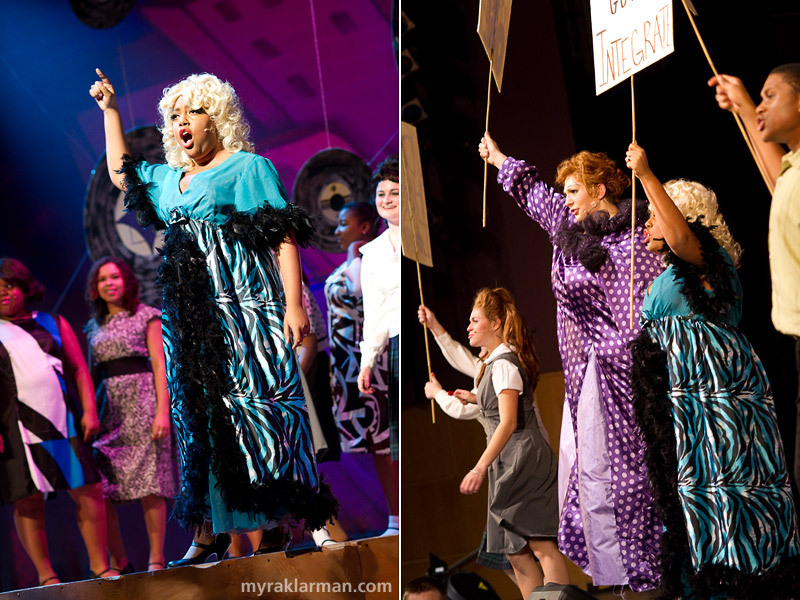 Motormouth Maybelle (Lauren Victor) wants everyone to know that she’s “Big, Blond, and Beautiful.” | Edna and Motormouth lead the protest march to integrate The Corny Collins Show. 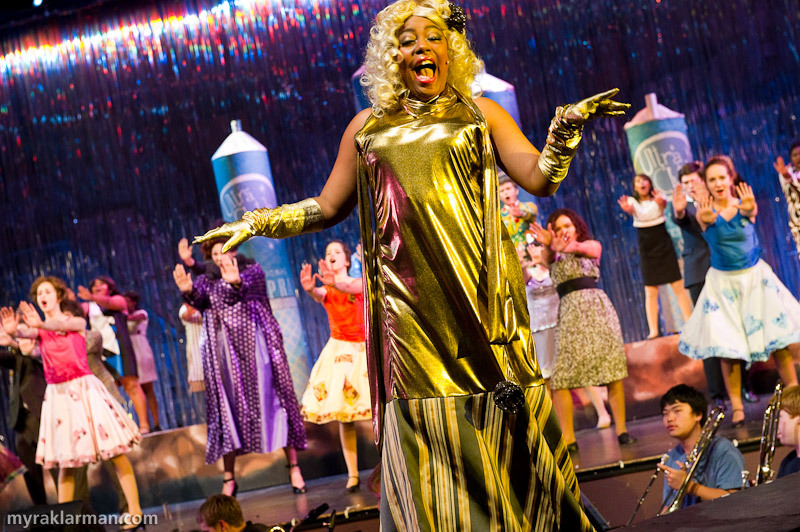 Motormouth Maybelle (Lauren Victor) delivers a wise, soulful — and showstopping — rendition of “I Know Where I’ve Been.” Man, how old are these kids?! 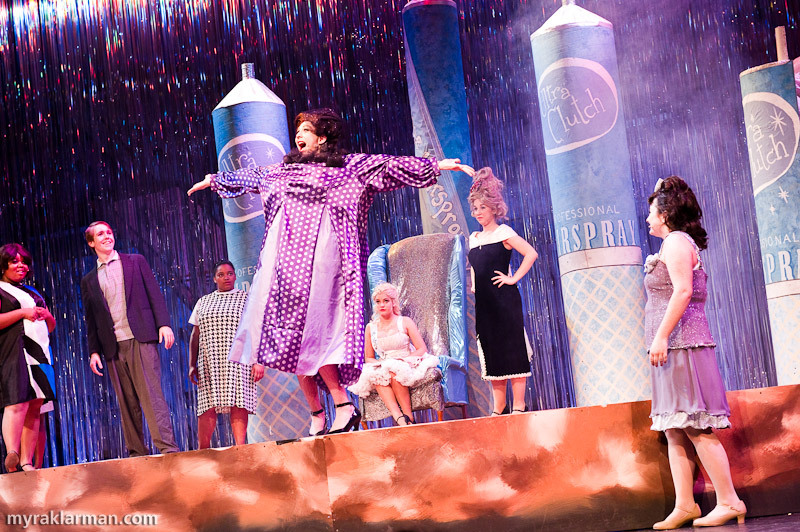 Edna (Russell Norris) surprises everyone when she explodes (in a dense fog of hairspray — great effect!) from one of the giant cans of Ultra Clutch. 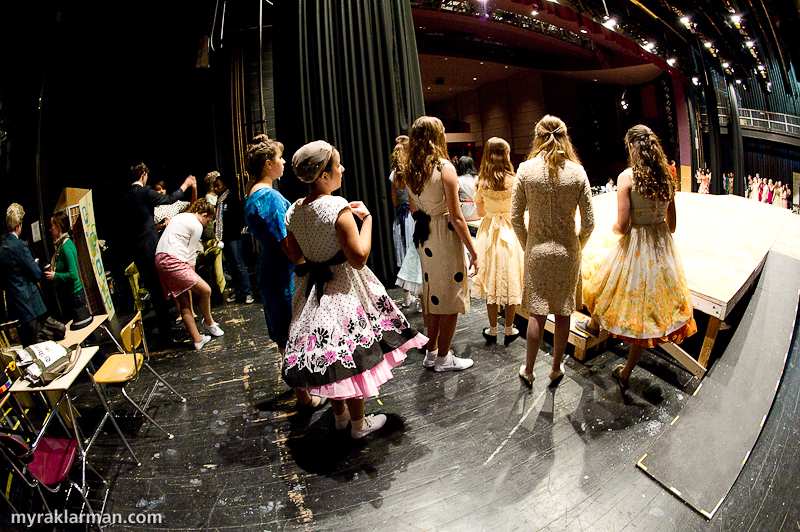 By opening night she would be wearing a different dress, which hadn’t been quite completed by the final dress rehearsal. 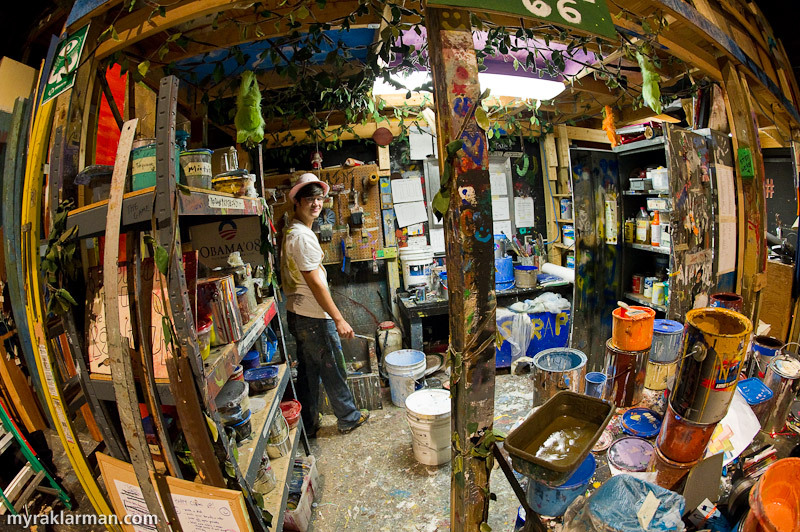 Members of the props crew gather in the set shop. 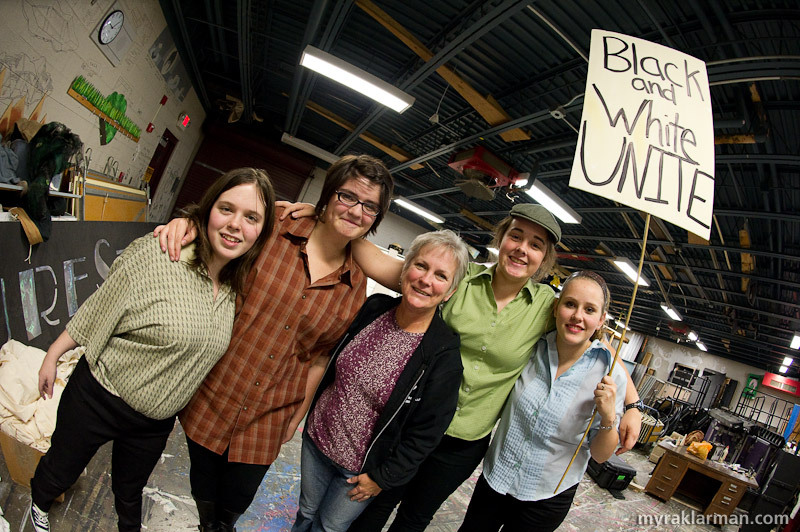 L-R: Sophie Morris, Grace Iverson, Paula Doering (props supervisor), Isabel McKay and Charlotte Sondermann (exchange student from Germany). 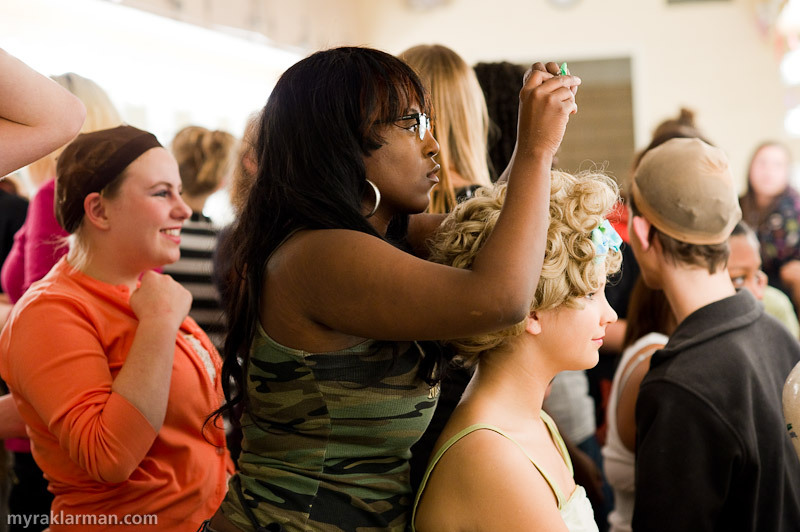 With Brandalyn Fulton back as hair and make-up designer, I knew that the numerous wigs featured in the production would perfectly capture the era. 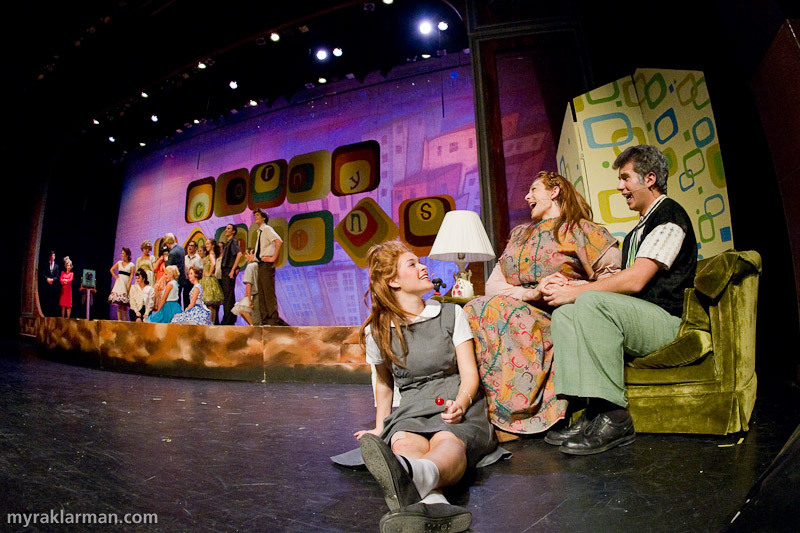 I was also a big fan of the work Brandalyn did for Pioneer’s Urinetown in the spring of 2009. 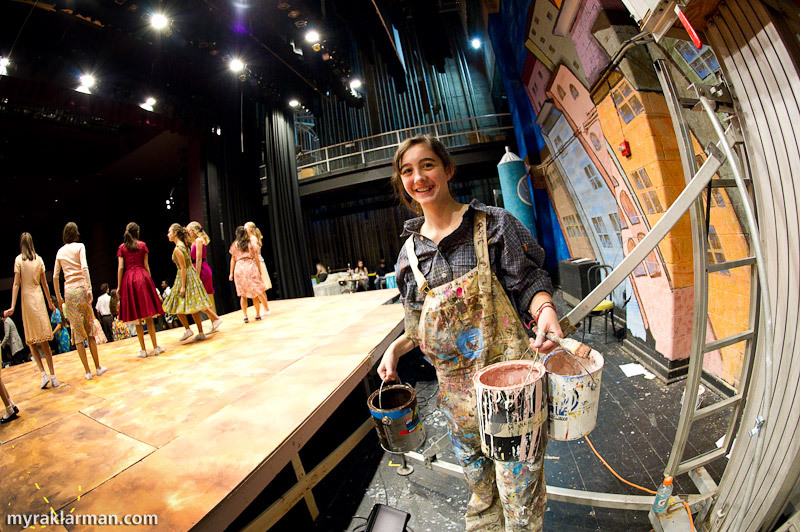 You would not believe how much gets painted in the hours leading up to opening night — including crew member Sara King’s overalls! I’m always amazed by how well you manage, in still images, to parlay the energy and essence of these live performances. I can almost hear the music. Looks like it was a fantastic show, and so much fun. Really makes me miss the highs of working in theatre! how can I get a copy of some of these pictures? 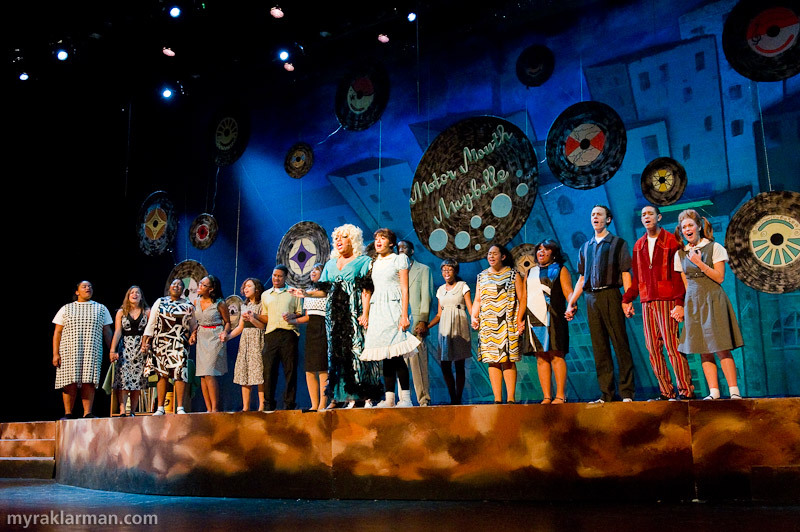 I would like to know where you got all your wigs and costumes because my Musical Theater class is also putting together a production of Hairspray and my teacher and hairdresser would like to know where you get your wigs. By the way beautiful photo’s!!! Thank You, Katerina S.